Remarl:1.When ordering,the name of pump shall be made up of pump model and blade wheel code. Forexamp:if it is an SPP20-50 pump with blade wheel code of A,then the name of the pump is SPP20-25A. 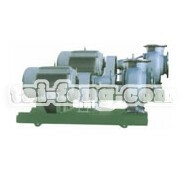 2.As for other pumps higher than SPP50-50 in specification,the motor model in the blank space of table should be agreed upon when ordering.